BONUS! 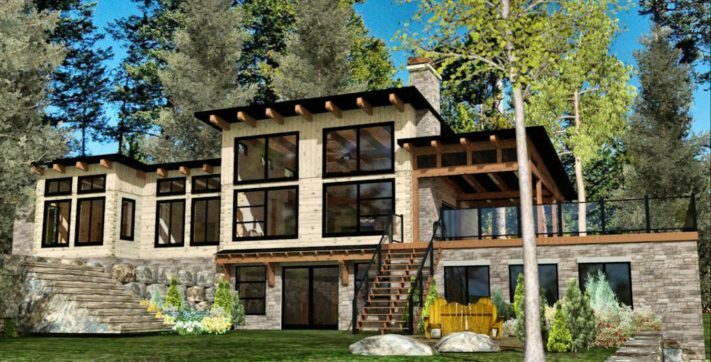 Get our modern log home floor plans. Love the idea of a log or timber frame home but also lean towards the clean look of contemporary architecture? Here’s the good news: you don’t have to choose. When we talk about log and timber frame homes, I think we all tend to envision the more traditional designs we’re familiar with. 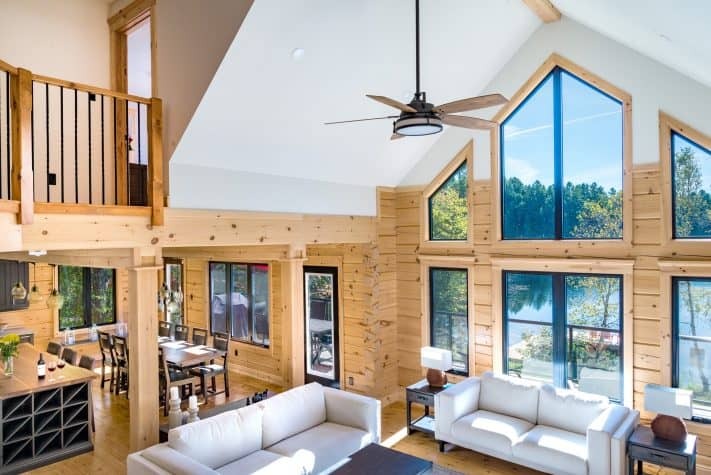 More and more log homes are expanding out of their classic lane and redefining rustic thanks to the popularity of cleaner lines and modern design. 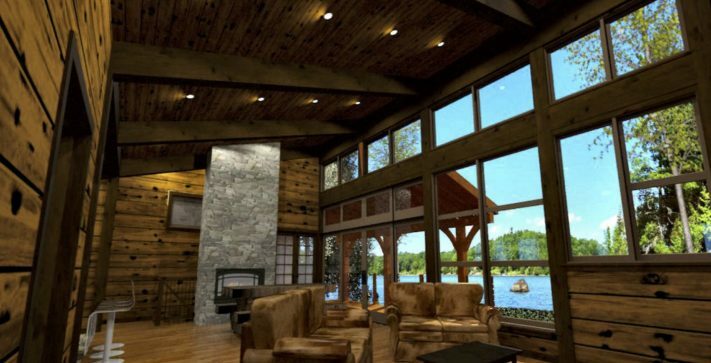 We believe log homes are much more versatile and attract buyers from across the design spectrum. So if you’re trending toward a more contemporary design, today we’ll focus on modern plans to help inspire you. 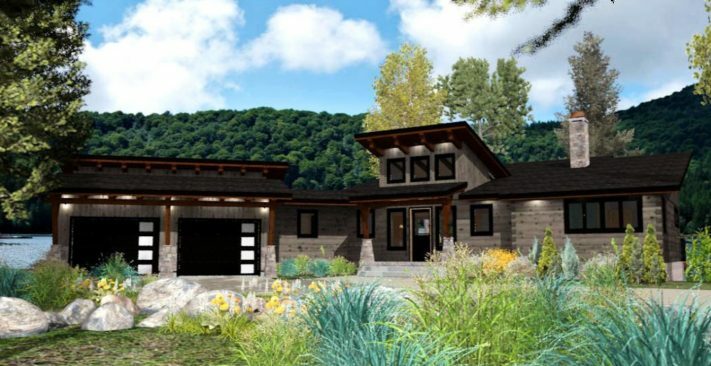 And, of course when you work with a log home company that specializes in custom plans like Confederation, you’ll have the opportunity make sure your modern log or timber frame home is exactly the way you want it. If you’re seeking a modern take on a log or timber home, skip the traditional A-frame plans and opt instead for a more modern exterior profile. If you download the modern plans offered on this page, you’ll see our modern designs all feature striking contemporary architecture that relies on strong, geometric shapes and clean lines. Each of our modern log and timber frame homes feature exposed timber elements to accentuate the exterior and interior of the home. 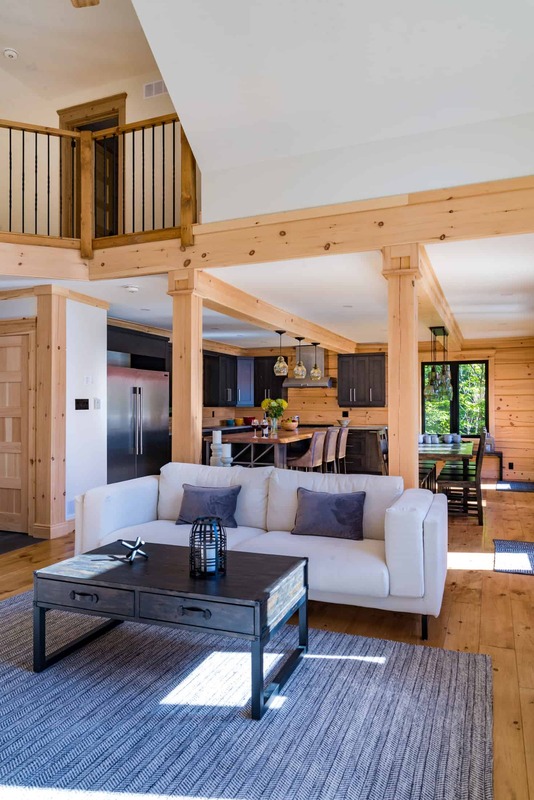 Traditional log and timber frame homes often rely on large-scale architectural features, like heavy logs and massive stone fireplaces, and small-scale elements, such as twig-style hand rails, to round out their rustic look. To create spaces with a more contemporary flair, skip these features in favor of more refined, angular details, like square timbers and metal accents. 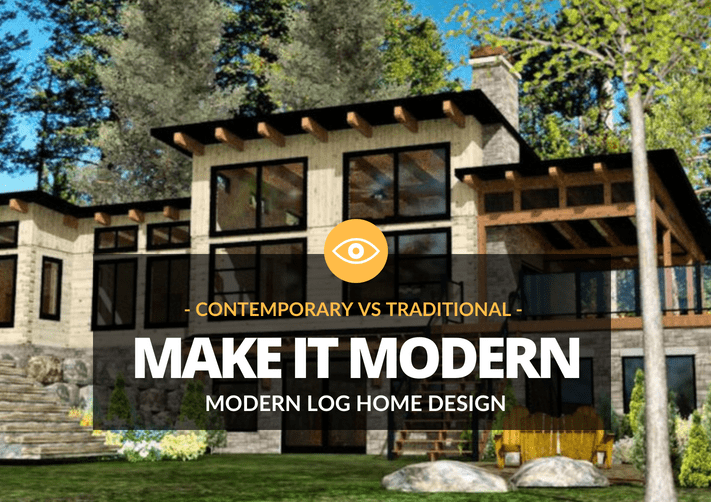 Because having a strong connection between indoors and out is a main tenant of the modern movement, logs and timbers are an ideal choice for a modern-style structure. Natural building materials like wood and stone take center stage within the framework of a simple, organic design. Pro Tip: Selecting the right stain for your logs and timbers will go a long way towards lending a modern edge to your wood materials. For an up-to-the-minute look, veer away from honey-colored shades and seek out clear or grey-toned stains instead. Or, go to the opposite end of the spectrum and opt for dark stains in cool tones, like walnut and ebony. If you’ve browsed a few our galleries and plans, you know that dark, closed-off log and timber frame homes are a relic of the past. All of our floor plans feature open concept layouts that fit today’s modern lifestyle. These wide-open plans make the most of your square footage and create an easy flow between spaces. Great rooms transition seamlessly into dining rooms and kitchens, allowing homeowners to connect with family and guests with ease. It’s no secret first impressions are everything. To give your home a modern feel at first glance, you’ll want to start at the top. Literally. The roofline of your home has a major impact on the overall style of your home’s exterior. An elaborate roofline with steep and even lower pitches signals a more traditional feel. Opt for a flat, sloping roof line to give your exterior an unmistakably sleek vibe. And don’t forget to consider material and color carefully. Steel is a solid choice for performance, while roofs in dark shades like charcoal and black will give your home instant contemporary style. One of the first things you’ll notice first in a modern-style log and timber home is the abundance of glass largely uninterrupted by dividers. Incorporating different types of windows, from floor-to-ceiling to clerestory styles, will make a statement from the outside and indoors. Expansive sheets of undivided glass blur the lines between inside and out, ushering natural light into spaces and creating an open, airy feel that is a must in modern design. Pro tip: Swap out traditional French doors for sliding glass walls or bi-fold doors to expand the home’s interior spaces to the outdoors. The interior finishes you choose will have a direct impact on the look and feel of your new log or timber home. The right selections can build a bridge between rustic materials and your home’s modern design. To find the right balance, focus on color and texture. 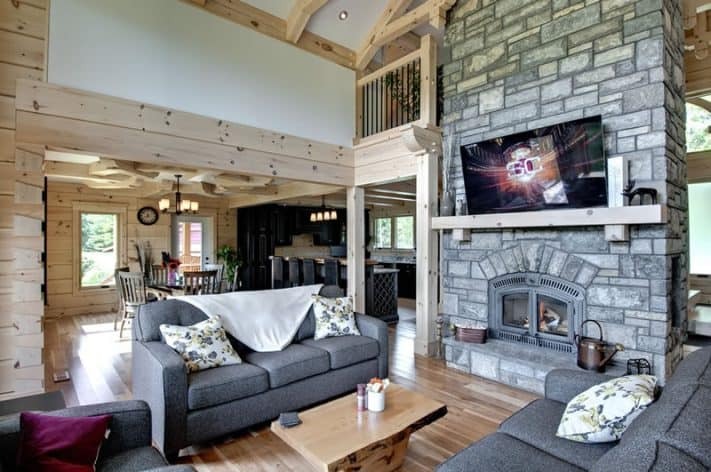 In a great room characterized by exposed logs and timbers and rustic flooring, add stretches of smooth, drywall or a fireplace made of architectural concrete to balance the space. In kitchens and bathrooms, opt for sleek plumbing fixtures, cabinets painted white, black or in shades of grey, and consider out-of-the-box countertop options, like polished zinc, concrete or quartz. Throughout the home, keep metal accents front and center for a contemporary, industrial chic look. Swap in metal supports for wood under overhangs and porches and opt for metal railings over traditional ones around decks and porches. Look for lighting fixtures made of glass and metal with simple silhouettes to play up a modern look in any room.